Juan R. Thomas is Of Counsel to Quintairos, Prieto, Wood & Boyer, P.A., and is the founder and principal of the Thomas Law Group. Mr. Thomas' practice includes the following specialties: real estate/estate planning, labor and employment, and family law. In addition, Mr. Thomas provides counseling and training to firm clients in areas involving personnel, collective bargaining, and business development matters. Mr. Thomas is the Immediate Past President of the National Bar Association (NBA) having served as the Association’s 75th President during the 2017-18 bar year. The National Bar Association is the largest Association of African-American lawyers, judges, and law students in the United States with a professional network of over 65,000 people. The National Black Lawyers: Top 100 includes Mr. Thomas on its list of the Top 100 Trial Lawyers, an honor given to only a select group of lawyers for their superior skills and qualifications in the field. Membership in this exclusive organization is by invitation only and is limited to the top 100 attorneys in each state or region who have demonstrated excellence and have achieved outstanding results in their careers. Mr. Thomas’ selection was based upon his performance as an exceptional lawyer in the practice area of matrimonial and family law in the state of Illinois. Mr. Thomas is a member of the Governmental Affairs Standing Committee in the American Bar Association’s (ABA). He also serves on the Council of the State and Local Government Section of the ABA and is also a member of the Editorial Board for the Human Rights Magazine for the ABA’s Section of Civil Rights and Social Justice. Mr. Thomas also serves on the Illinois State Bar Association’s Standing Committee on Racial & Ethnic Minorities and serves on the Cook County Bar Association Board of Directors. Mr. Thomas’ passion is community and public service. While in law school, he successfully ran for the West Aurora School Board, commuting 120 miles each way every weekend during the campaign. At the age of twenty-five (25), Mr. Thomas became the youngest person ever elected to the West Aurora School Board and became the first African-American ever re-elected to the Board in 1999. While on the school board, Mr. Thomas served as Chairman of the Board’s Personnel Committee. Mr. Thomas continues to serve his hometown of Aurora as a member of the A+ Foundation Board of Directors for West Aurora School District #129 which supports and promotes educational, cultural, and charitable programs for the students and alumni. Mr. Thomas has also demonstrated his commitment to education and the community by serving as an adjunct professor at North Park University, Aurora University, and Robert Morris College teaching courses in conflict resolution, negotiation strategies, and business law in addition to volunteering as a public speaker with Chicago Public Schools through their Communities in Schools Program. In 2004, Mr. Thomas was elected a Delegate to the 2004 Democratic National Convention in Boston. The following year in 2005, he was elected Aurora Township Clerk becoming the first African-American to win a township-wide office in Aurora, IL, the second largest city in the state. In 2009, he was re-elected Aurora Township Clerk with 57% of the vote receiving more votes than any other candidate seeking an Aurora Township office that year. Mr. Thomas was the first Democrat ever to serve as Aurora Township Clerk. 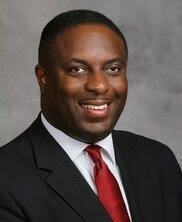 Mr. Thomas serves as the General Counsel of the Morehouse College National Alumni Association. Mr. Thomas also serves on the Board of Directors of Mutual Ground Inc., an organization committed to providing services to victims of domestic violence and sexual assault and their families. He also serves on the Board of Directors for the University of Illinois College of Law Alumni Association, Leadership Greater Chicago Fellows Association, and 100 Black Men of Chicago, Inc. Mr. Thomas is also the 1st Vice President of the DuPage County Branch of the NAACP and State Chair of the Legal Redress Committee for the Illinois State Conference of the NAACP. Mr. Thomas has previously served on the Boards of Directors for the Community Renewal Society and the Illinois Campaign for Political Reform. Mr. Thomas is a graduate of Morehouse College in Atlanta, GA where he earned a Bachelor of Arts degree in Political Science. He received his Juris Doctor and Master’s in Educational Policy Degrees from the University of Illinois in Champaign-Urbana. Mr. Thomas is an ordained Baptist minister and recently completed course work to receive his Master of Arts degree in Religious Studies from the University of Chicago School of Divinity. Mr. Thomas and his wife, Angela, are proud members of St. John AME Church in Aurora where he serves as the Minister for the Men's Ministry.